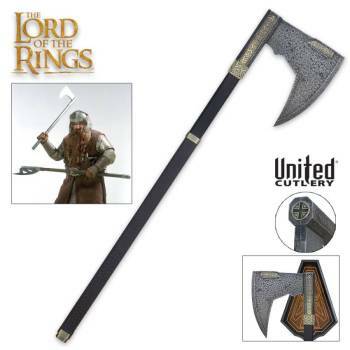 United� Cutlery, industry leader, has meticulously recreated the actual filming prop. 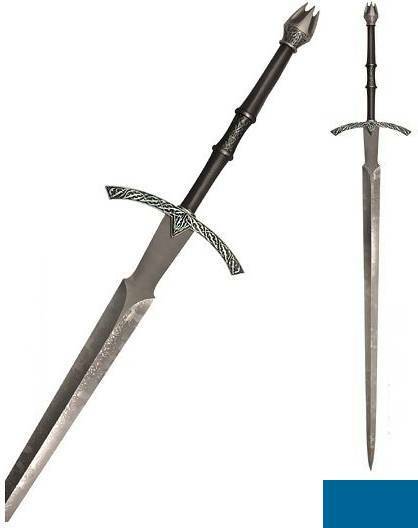 The blade was created from stainless steel instead of carbon steel as used on the original prop, in order to guarantee the replica will last a lifetime with little maintenance. The replica was created using the finest grade materials and craftsmanship available. 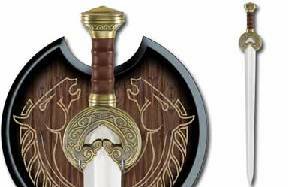 Each replica is laser-serial-numbered on the blade and marked with the appropriate copyrights to ensure authenticity. 40" Overall with a 26" sharpened, stainless blade with simulated temper. ABS handle in the shape of a dragon. Black lacquer scabbard with cast metal fittings. Cast metal tsuba and habki with a gold finish. Wooden vertical stand and fixings included! 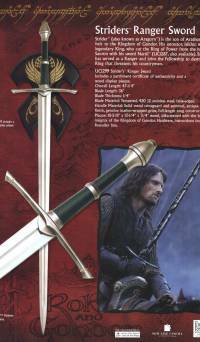 Overall length is 36.5" and the blade length is 27.5". Made from tempered, 420 J2 stainless steel with a double fuller grind and false-edged, The word 'Herugrim' is translated as meaning "fierce sword." 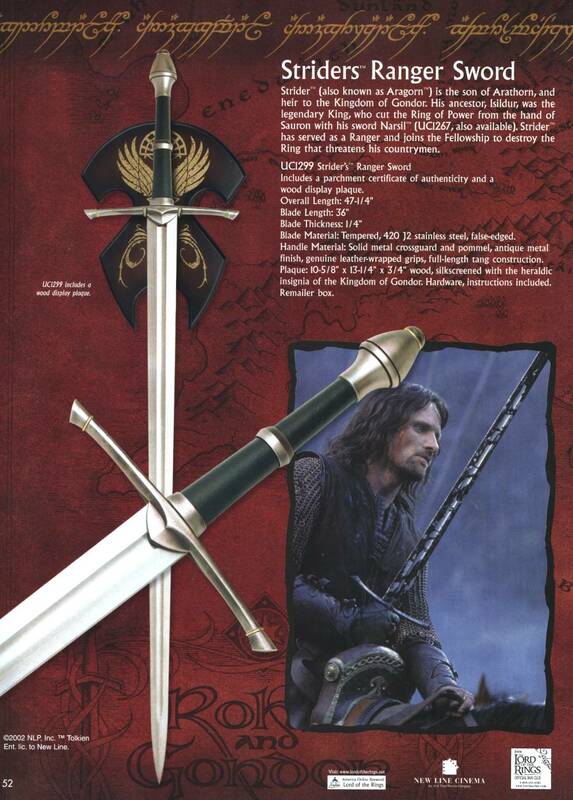 Stunning item, exact replica of the movie version, looks incredible with the sword, a few minor marks to be expected. Known primarily for their innate abilities to smith metal and stone, Dwarves are proud and strong-willed, ready for battle at a moment's notice. 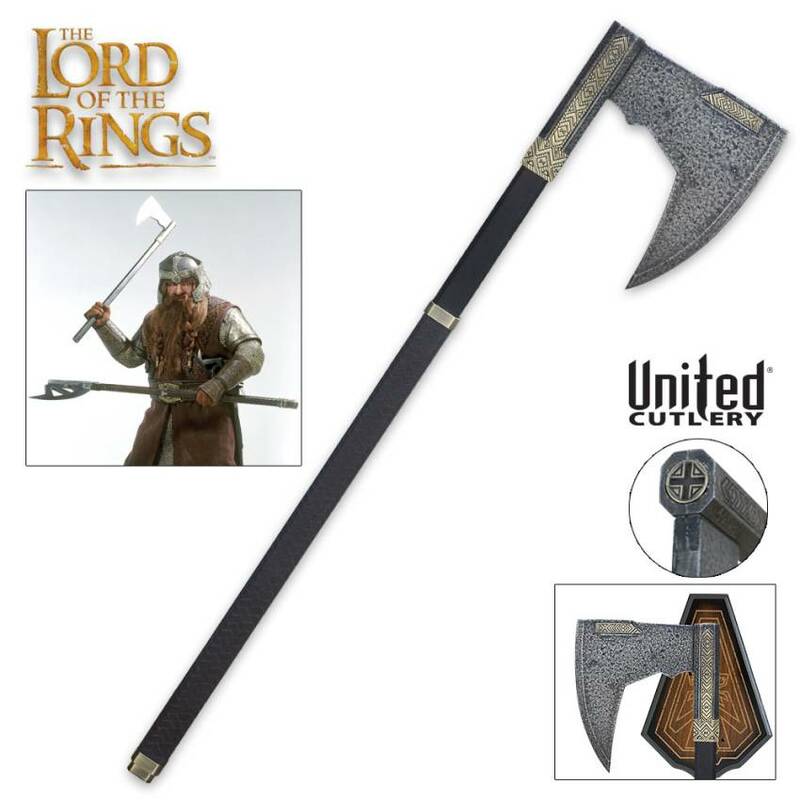 Like many Dwarves, Gimli, son of Gloin, favours the axe as his primary weapon. Accompanying his father to the Council of Elrond at Rivendell, Gimli is chosen to represent the Dwarves in the Fellowship of the Ring. After the Fellowship becomes separated, Gimli fights valiantly alongside Legolas and Aragorn from the Battle of Helms Deep to the Black Gates of Mordor. With his unshakable determination for success, he proves to be a valuable aid to the Fellowship. Prepared for as many different situations as possible, he carries the Battle Axe with him, along with his Walking Axe, Bearded Axe, and two throwing axes. Heavy polystone construction with wooden shaft, priced to reflect overall quality. 44" Overall in length with sharpened, stainless blade and faux leather wrapped handles. 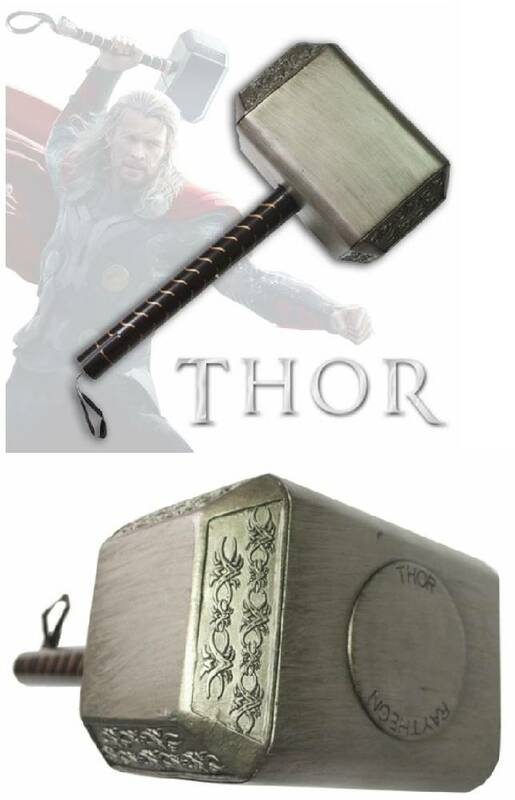 Substantial item weighing almost 3 kilos, quality of finish is fair only.